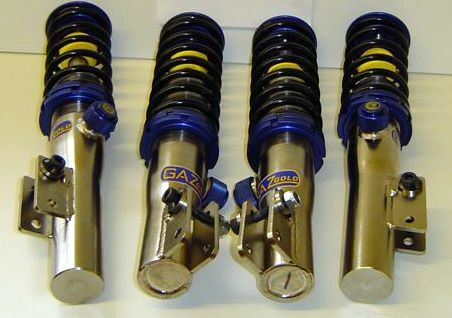 Fully height adjustable kits are a premium range of suspension units designed for tarmac motorsport and the serious track day enthusiast. But also suitable for road use. Be the envy of all your friends with these ultimate shock upgrade units, these are not only stunning to look at but are properly built road and race equipment, we honestly belive these are the best equipment available. No problem on sending these international, just enquire first for best shipping rates at current prices first. 5. The coilovers and telescopic units in this range utilise lightweight billet alloy components where possible, i.e. bases, end fittings, seats, lockrings, rod guides and gland nuts. The outer tube is steel with a nickel coating to provide the best anti corrosive finish possible. All outer alloy components are anodised.